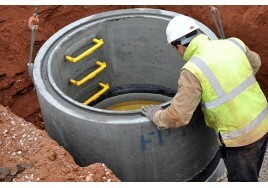 Concrete chamber sections/rings are generally used for deeper manholes where larger size drainage is being used. Manhole rings are manufactured with tongue and groove joints designed to accommodate flexible jointing compound or cement mortar and come complete with 4 steps per metre. Approximate weight per metre including steps = 875kg. We can offer discounts on these products for larger orders. Please contact our sales team on 01274 602367 or email sales@buildershoponline.co.uk where we'll get you the best prices possible. Also, we are able to offer much larger diameters which may be classed as special orders, please speak with our team for details.